Mites TECHNOCID insecticide solution eliminates all food moths and mites that invade the textile habitat. 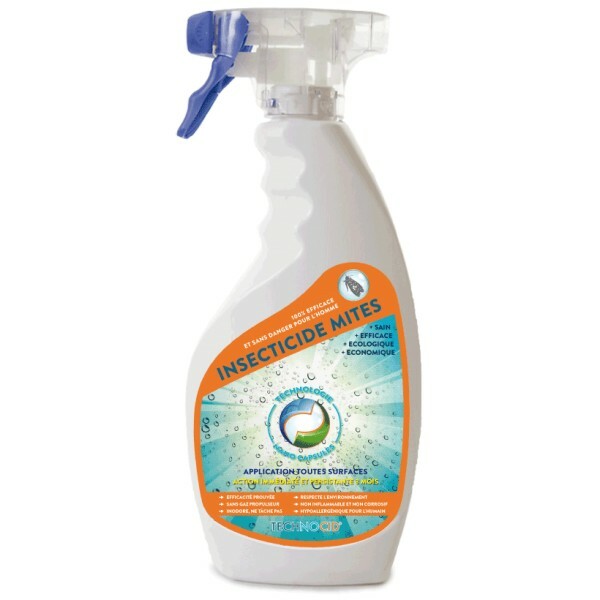 Mites TECHNOCID insecticide treatment eliminates all food moths and mites that invade the textile habitat. A distance or preventive, it also generates a strongly repulsive extended against these pests. TECHNOCID be used indoors or outdoors on any surface, odorless and tasks. Applies to clothes, skin, curtains, bedding, sheets, walls and other media. Quick effect and lasting more than 3 months - Dermatologically tested on humans. APPLICATION: Shake before use. For each application, the rotating tip 90 °. Hold the bottle upright and spray 30-50 cm insects and passageways. Nano-molecular capsules contained in the aqueous solution can diffuse lessubstances active with greater efficiency while significantly reducing the toxicity to humans.